The Karaokepedia beta was getting too many hits for mainstream songs so I made a new J-music site. 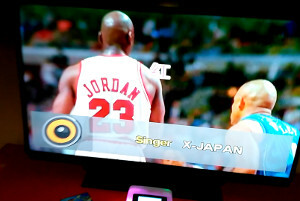 There are hidden Japanese songs in some Philippine Karaoke machines. Our list has the songs from TJ Media and Platinum karaoke, 2 of the most popular and widespread brands in the market. We also have a Google Sheets spreadsheet that you can copy, save, share or print. TJ Media's premium machines, TKR-304P and TKR-305P, both have hidden Japanese songs. These are the machines used in arcades like Quantum Amusement and World of Fun, as well as many KTVs. To check if the machine is TJ media and has JP songs, enter 61119 - the code for Cha-La Head-Cha-La. Filter our list to TJ Media to see the list of songs we extracted from the Korean app. Note that TJ Media only has songs up to late 2011. Some 2011 songs like Magia also didn't make the cut. Lyrics are displayed in furigana and are NOT transliterated/romanized. Platinum's hard drive based machines may have Japanese songs installed in them. The machines in Timezone arcade's "Deluxe" rooms have these JP songs but some branches disable them. KTVs using Platinum's premium model, HD-10, may also have JP songs if they installed the optional international song update. To check if the machine is Platinum and has JP songs, enter 89525 or 24525 - the code for 微笑みの爆弾 (Hohoemi no Bakudan). Filter our list to Platinum to see the list of songs we extracted from the JP update file. There are 2 numbers, the smaller number being the different code range for HD-10. We also noticed that some Platinum machines have JP songs in other code ranges but so far we haven't found a list for these songs. Note that Platinum carries old songs, mostly 80's and 90's. There are some 00's songs like READY STEADY GO, but they are very few compared to the other songs. 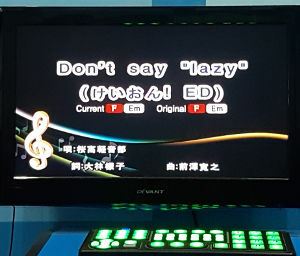 Lyrics are displayed in a really weird Simplified Chinese + kana hybrid and are NOT transliterated/romanized. Up to a few years ago, Kumyoung was the preferred machine for J-Pop fans and otaku in general since their machines were up to date and you can search for songs at their website. Unfortunately they have lost most of their market share to TJ Media and Platinum. Also, most of the remaining KY machines in malls and arcades have JP songs disabled. If you're lucky to find a working KY machine, just go to their website to search for songs. Their search engine is not kanji friendly, so enter romaji when searching instead. We do not have info on JP songs in Hyundai HDT, Megapro, or the custom karaoke setups in some KTVs like Red Box and Centerstage. For corrections and general comments, join our Facebook Group.